It’s no secret that diverse workplaces, from real estate franchises to Fortune 500 boardrooms, benefit immensely from diversity. In fact, Women in Business: The Value of Diversity—a 2015 study from global advisory firm Grant Thornton that analyzed S&P 500 companies—reports that American companies without female executives missed out on $567 billion in revenue in 2014. Diversity in the workplace leads to diverse thought, solutions and plans. Companies generate a more well-rounded understanding of the consumer that contributes to innovation. Unfortunately, findings such as these have not been enough to encourage some companies to practice diversity. The California Association of REALTORS® (C.A.R.) reports that women comprise about 42.3 percent of California REALTORS®, compared to 57.3 percent that are men. Of these women REALTORS®, 71 percent are white; 11 percent are Hispanic; 9 percent are Asian; and 3 percent are African American. This lack of diversity is mirrored in the representation of minorities in brokerage ownership. According to C.A.R., women make up 45 percent of brokerage owners in California. Of them, 70 percent are white; 10 percent are Asian; 9 percent are Hispanic; and 5 percent are African American. The NAWRB 2017 Women in Housing Ecosystem Report compares these numbers to data from the U.S. Census Bureau’s 2012 Survey of Business Owners (SBO). The SBO includes data for over 340,000 firms in California, including brokerages, real estate lessors and other related firm types. In 2012, women represented almost 30 percent of business owners, while 15.7 percent were equally owned by a male and female owner. Of women business owners, 72 percent were white. Even with this broader category, minorities are still underrepresented. While these regional statistics on the racial and gender divide in real estate don’t encapsulate the entire industry, they do parallel a worrying trend. These gaps are especially visible in commercial real estate, where women face an approximate 23 percent income gap in median annual compensation, according to CREW Network’s 2015 Benchmark Study Report. The report further affirms that the representation of Hispanic women, Asian women and African American women in commercial real estate senior executive positions is less than 1 percent. These statistics are representative of an industry not increasing its diversity, of professionals not fully considering their diverse clients and their buying power. As women and minorities increase as homebuyers, the industry should reflect this growth. When an agent’s top priority is helping their customer, the foundation for success is already established; however, there may be an advantage to the diversity of your company. If you’re serving minorities, you can leverage the minority workers; if you’re working with women buyers, women agents can possess a unique understanding of what these clients want throughout the home-buying process. 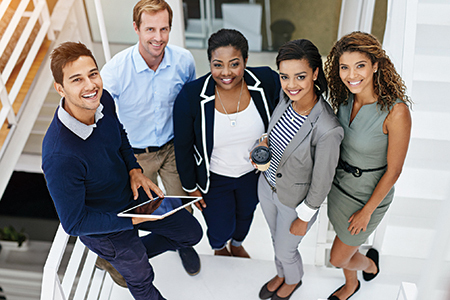 Whether it helps relieve a language barrier or a personal client preference, capitalizing on diversity in your company can position you to better serve a diverse client base and grow your bottom line.